"The Original Spill-Proof Bowl" Made In USA POURfect® Bowl sets are available in 6-8-12 cup sizes. They are microwave and dishwasher safe and are made of stain resistant polypropylene. GRIP - Rests comfortably over your index finger, using your palm and thumb instead of grasping with your fingers. EGG CRACKING LEDGE - Convenient location to crack eggs while keeping the entire cracked egg inside the bowl. MEASURING GUIDE - English and Metric measurements inside the bowl. 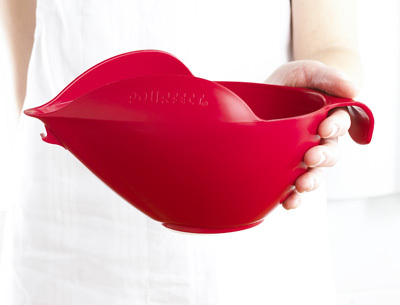 GULL WINGS - Fold ingredients back into bowl toward the pouring spout COMPLETELY eliminating over spill. RUBBER RING - Non-slip rubber ring adds stability to POURfect® Bowl when mixing ingredients. CHANNEL - Aligns ingredients to flow smoothly to the pouring spout. PIVOT - Securely positions bowl on another container improving control while pouring. DRIPLESS SPOUT - Flat edge on spout stops drip from running down the front of the POURfect® Bowl.